A MISERABLE Dr McKenna Cup campaign drew to a harrowing conclusion for Antrim last night as Fermanagh claimed a 14-point win at Brewster Park. Defeats in the pre-season competition are normally taken with a pitch of salt, but this loss clearly rattled the Antrim players and management. As the floodlights were dimmed at the Enniskillen venue, the Saffron players remained on the pitch trying to make sense of what had happened. For over 70 minutes they were overran by a side just one division above them. While the Saffrons were hampered by a large amount of absentees, the listless showing and their third defeat in succession is a cause of concern for Frank Fitzsimons and Gearoid Adams so soon to the start of the National League. The first 35 minutes was a woefully one-sided affair from an Antrim perspective. The hosts dominated every sector of the pitch as the Saffrons struggled to gain a foothold in the game. Paul McCusker and Tomás Corrigan (free) raised early white flags for the hosts, but Antrim were getting little change from a well-drilled Fermanagh defence in the opening stages. The game’s first mark, taken by Eoin Donnelly, should have led to the first goal but Aiden Breen’s low shot was stopped by the outstretched leg of Antrim goalkeeper Ronan Hanna. Antrim’s woes were illustrated by Tomás McCann, who missed a relatively straightforward chance to open his side’s account on 19 minutes. Fermanagh, in stark contrast, hit some fine scores via Barry Mulrone, Cathal Beacom and wing-back Patrick Reihill. By the 20-minute mark, they led by seven. Conor Murray couldn’t find the target from close range as Antrim’s play became more and more disjointed. Frustration got the better of Marty Johnston when, on 27 minutes, he was shown a black card for hand trip on Breen. Corrigan struck the resultant free short but was on target moments later from another free and two Sean Quigley points ensured that all the starting forwards for Fermanagh scored in the first half. Leading 0-11 to no score at half-time, Fermanagh weren’t as efficient in the second half as they sought to claim a semi-final berth via the best runners-up slot. The impressive Aidan Breen should have at least tested Chris Kerr, who replaced Hanna at half-time, early in the first half but he blasted his shot over the crossbar when through on goal. Antrim finally managed to get on the scoreboard when Ryan Murray’s snapshot split the posts on 45 minutes to leave the score 0-12 to 0-1. However, it would be another 15 minutes before Antrim added to their tally. Fermanagh substitute Eddie Courtney scored within seconds of his introduction while Corrigan landed with a stunning point from play. Pete McGrath’s side had landed 0-16 by the time Antrim scored their second with Tomás McCann scoring a free. The Cargin attacker added another moments later when Conor Murray was fouled. The Saffrons maintained their brief purple-patch when Stephen Beatty scored an excellent point from play before McCann scored a third free. Their run of points came to an end when Courtney landed his second of the night while Paddy McBride was issued with a black card for dragging the Fermanagh sub to the ground. McGrath’s side will now face the holders Tyrone in Sunday’s semi-final at Clones while Derry and Monaghan clash in the other semi in Armagh. 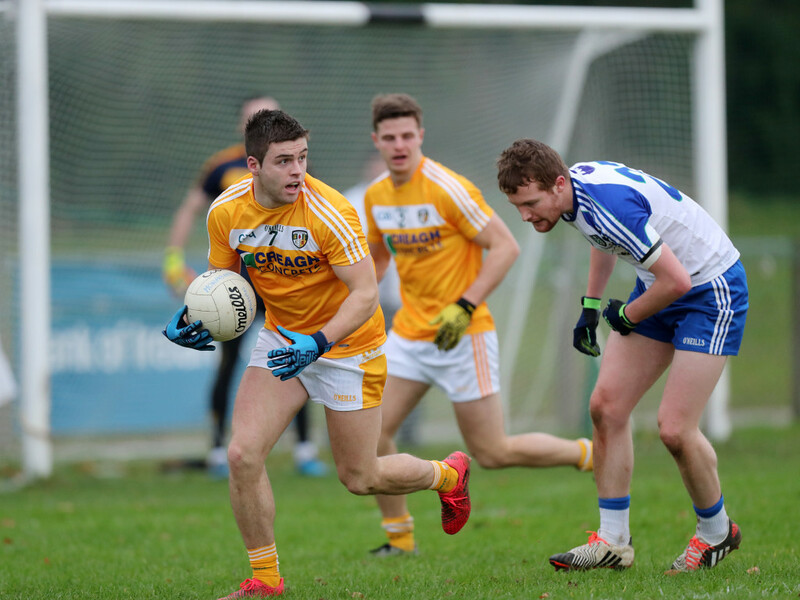 For Antrim, there will be much soul searching in the coming days ahead of a trip to Tipperary on Sunday, February 5. FERMANAGH: C Snow; M Jones, C Cullen, J Allen; D McCusker, R McCluskey; P Reihill 0-1; L Cullen, E Donnelly; P McCusker 0-1 , C Beacom 0-1, A Breen 0-4; B Mulrone 0-2, S Quigley 0-2 (0-1 ’45), T Corrigan 0-5 (0-3fs). Subs: D Keenan for P McCusker (HT), E Courtney 0-3 for Beacom (49mins), K Connor for McCluskey (50mins), E McManus for Quigley (58mins), K McDonnell for D McCusker (61mins), R Hyde for L Cullen (62mins). ANTRIM: R Hanna; C Hamill, S Tierney, P Gallagher; P McBride, J Laverty, R Scott; M Johnston (Creggan), S Beatty 0-1; S McGarry, R Murray 0-1, C Murray; C Small, T McCann 0-3 (0-3fs), R McCann. Subs: K Quinn for R McCann (9 mins), S Tully for Johnston (BC 27mins), C Kerr for Hanna (HT), B McQuillan for McGarry (44mins), L McLarnon for Small (55mins), O Eastwood for McBride (BC 68mins).